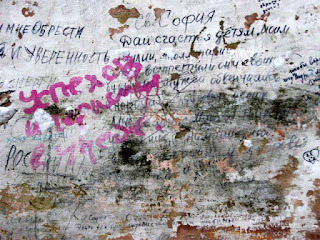 My first visit to Moscow was over forty years ago, deep in the Soviet era, completely controlled and supervised by the Intourist Organisation. We were not free to visit anywhere independently, nor to attempt to speak to anyone other than the Intourist guides.Self expression was dangerous, faith was underground. I remember drawing back the curtains in the splendidly faded Metropol Hotel, just off Red Square and looking out over a small area of garden. The snow lay deep and crisp and even and no adult or child, nor even a dog had deviated from the assigned paths. Some seven years ago my husband and I visited again, and were yelled at by police for not using a pedestrian crossing in the gardens of the Kremlin. The road was completely free of traffic, but we were made to walk back and use the official crossing point. On this visit I sensed a tentative freedom in the city, even a slight lifting of the rules. We visited the hauntingly beautiful Novodevichy Convent on a glitteringly cold afternoon. This, one of the city's oldest religious centres, developed from the 15th century, part of the city's defences as well as a convent and a sort of prison for ladies of high rank.There is an extensive lake outside the high, fortified walls, and muffled figures slid and tottered around on its frozen surface. Small children were being drawn along in little padded sleighs, the children themselves so engagingly padded that they looked like TeleTubbies. A couple of people sped along more efficiently on skis. The signs at the edge of the lake forbade people to go on the ice. Near to the main entrance of the convent the base of a buttress was covered in graffiti, admittedly most of it in beautiful script. Petitions to Saint Cyprian; 'A better job for Ludmilla', 'Health for my son'. The guards stand by, but the petitions are not removed, nor are people punished for making them. On a little ornamental bridge there are dozens of brightly coloured padlocks clasped to the decorative railings. They bear the names of those recently married, or otherwise wishing to announce a relationship. In a couple of places the railings have been broken, presumably to remove the padlock of those no longer locked in love. I wonder if these padlocks come with two keys, or perhaps no key at all, as an emblem of permanence? High in the hills in the countryside a multitude of little flags flutter in the wind. 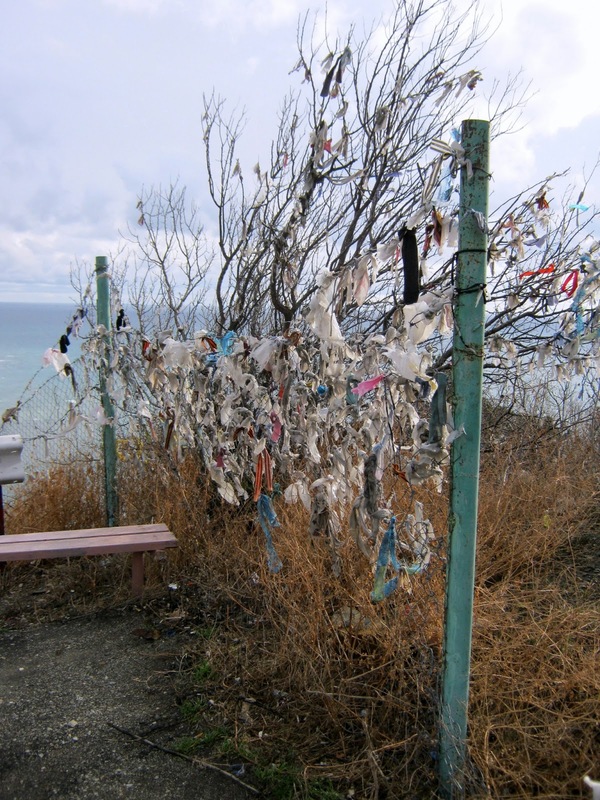 Scraps of fabric tied to twigs and fencing, like Buddhist prayer flags. They are a sort of prayer flag, signs of hopes and dreams and wishes. My kind Russian host rips up a perfectly good handkerchief and I tie on a few flags of my own for family members back in England. Grand-daughter now has her own little flag flying in Russia! 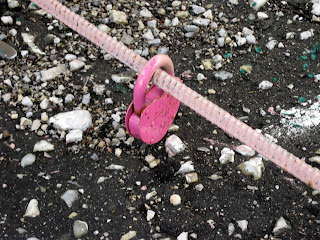 Then I notice that among the little flags are scraps of knicker elastic, lace and fragments of someone's tights. Humour and the expressions of new freedoms. Elephant's Child: I love to see the little TeleTubbies fall over. They bounce! I fear you're bringing the snow back with you! Love the flag idea and the padlocks. Freedom does leak in haphazardly, everywhere, eventually. I kept thinking of Boston, where jaywalking is not a misdemeanor, it's a Civil Right. Jee: I'm a bit dismissive of the English panic about snow after my recent experiences! Should we think about introducing padlocks in Middle England? Zhoen:, Yes, it's not good to be beaten up for jay-walking! Molly: I hope you get there. It will be a great experience, I'm sure. I was in Moscow in 1971, Relatively Retiring. I had the distinct impression then that, if briskly crossing a road, a car far in the distance would accelerate towards you, so that you ended up skipping out of its way. A common experience or paranoia? What rich experiences you have had. Such a pleasure to read. Frances: thank you for your comment. I certainly experienced feelings of paranoia in the Soviet era, and even on my previous visit some years ago. What made it all so different this time was being with a Russian family who looked after me with infinite care. I am so very grateful to them. Oh, how wonderful. I love the "prayer flags." Must be so interesting to see how things have changed since the Soviet era and then some. Leslee: Extremely interesting, but part of the radical change was that I was with a Russian family, not Intourist. 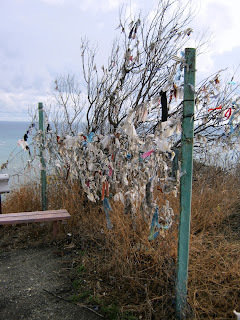 Prayer flags, road-side shrines etc. seem to be common to most cultures and faiths. A very interesting and beautifully written post. But it does look a bit chilly! Isabelle: thank you - yes Moscow is COLD, but it was much milder when we travelled south to the Black Sea. Pick the Mushrooms - Don't Drink the Water.